The city of Atsugi, where Kanagawa Institute of Technology is located, is in the center of Kanagawa Prefecture, in the suburbs of Tokyo. 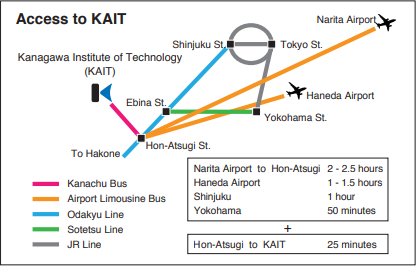 From Hon Atsugi Station, the train accessibility is high to nearby cities as Tokyo and Yokohama. Car: 3km from Tomei Atugi Expressway, 2km from Ken-O Ebina Expressway.